Watch your favorite episodes right now on our WPBT South Florida PBS video portal. Pick from hundreds of shows from popular national programs to new local shows. Download our program guide! Find out what to watch this month plus station news and community events. Download KidVision PreK's free iPad app featuring 40 interactive games and 10 virtual field trips! Hosted by Emmy award winning journalist, Pam Giganti, this program brings together diverse voices offering fresh perspectives on current events and community news. WPBT Passport is a member benefit that provides you with extended access to an on-demand library of quality local and national public television programming. WPBT Passport is the new member benefit that provides you with extended access to an on-demand library of quality local and national public television programming. With access to tens of thousands of hours of your favorite programs, WPBT Passport allows you to watch even more episodes of your favorites, including full seasons of many current and past series. Highlights include every past episode of award-winning MASTERPIECE favorites like Downton Abbey and Wolf Hall, along with Grantchester, Home Fires, Mr. Selfridge and Poldark. You can watch hundreds of hours of Nature, NOVA, Antiques Roadshow, American Experience (including JFK and Walt Disney), Finding your Roots, The Great British Baking Show, Ken Burns documentaries like Jazz and Prohibition, and so much more. By becoming a member of WPBT South Florida PBS today with a yearly, tax-deductible contribution of $60 or more (or ongoing $5 per month, as a sustaining member), you’ll be among the first to try our latest member benefit. CLICK HERE to get your Passport activation link if you have given WPBT your email address. Once Passport is activated, go to our Video Portal or the PBS APP, Sign in with your PBS Account and enjoy! The WPBT South Florida PBS Passport library currently offers members more than 1,000 episodes from popular shows like American Experience, American Masters, Antiques Roadshow, Nature, NOVA, and Masterpiece — including all six seasons of Downton Abbey. In addition to these signature series, the library is full of public television’s acclaimed arts, science, history, and lifestyle programs; including How We Got to Now, Earth a New Wild, Austin City Limits, and a rotating selection of films from Ken Burns — currently Jazz and Unforgivable Blackness The Rise and Fall of Jack Johnson are available. More shows are being added all the time. You can watch WPBT Passport and our on-demand videos on your computer, smartphone, or tablet through the WPBT Video Portal, at PBS.org and within the PBS Video apps for iOS and Android smartphones and tablets. You can also access WPBT Passport on Apple TV, and additional device platforms are coming soon. To find WPBT Passport video, look for the distinctive compass icon: . WPBT Passport is a new member benefit which provides WPBT South Florida PBS donors extended on-demand access to a rich library of quality public television programming online and on your mobile device. WHAT KIND OF CONTENT CAN PEOPLE FIND ON WPBT PASSPORT? With WPBT Passport you can access tens of thousands of hours of programming, representing many genres, including drama, science, history, natural history and the arts. Notable titles include MASTERPIECE series such as Downton Abbey and Wolf Hall, along with other favorites such as Nature, NOVA, Antiques Roadshow, Finding Your Roots, Great Performances, Vicious, How We Got To Now, The Great British Baking Show and many more. The WPBT Passport library will continue to grow as more series and episodes are added. I ALREADY CONTRIBUTE TO WPBT. CAN I VIEW WPBT2 PASSPORT CONTENT? If you are an active WPBT South Florida PBS member giving at least $60 (or $5 monthly), and we have a valid email address on file, you may have already received an email "WPBT Passport" with activation instructions. If you did not receive an email, you can activate your WPBT Passport account by going here and entering your email address. If you are still having trouble accessing WPBT Passport please contact Support at 1-844-417-6327. I AM A MEMBER OF WXEL OR ANOTHER PBS STATION. AM I ENTITLED TO WPBT2 PASSPORT? WILL THERE STILL BE FREE STREAMING ON WPBT2.ORG AND PBS.ORG? PBS and WPBT content will continue to be available for free on the WPBT2.org website, and other digital platforms. 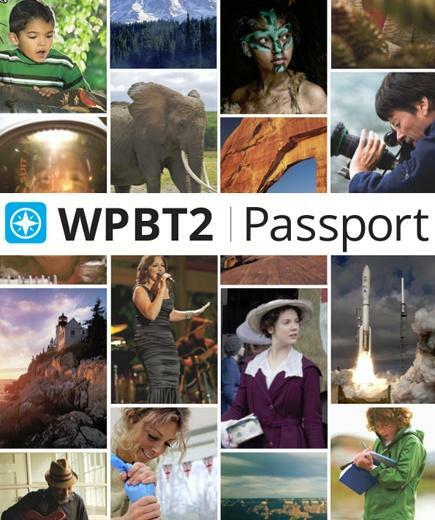 WPBT2 Passport provides extended access to the rich library of content for WPBT members to enjoy. Certain content, including kids, news and public affairs programs such as Cyberchase, Bob the Builder, Thomas & Friends as well as FRONTLINE, PBS NewsHour, Independent Lens and POV, will remain accessible to everyone. WHAT KIND OF DEVICE DO I NEED TO VIEW WPBT PASSPORT VIDEOS? You can watch WPBT Passport and our on-demand videos on your computer, smartphone, or tablet through the WPBT Video Site, at PBS.org and within the PBS Video apps for iOS and Android smartphones and tablets. You can also access WPBT Passport on Apple TV, and additional device platforms are coming soon. HOW DOES WPBT PASSPORT ALIGN WITH THE MISSION OF PUBLIC TELEVISION? WPBT content is shared widely with the public on-air, online and on mobile devices after a program airs – that has not changed. WPBT Passport goes one step further by offering extended access to additional content for members. I'M NOT SEEING MY FAVORITE PBS SHOW IN WPBT PASSPORT. WHY NOT? Initially, hundreds of hours of on-demand content will be available via WPBT Passport along with tens of thousands of hours of content available to all. This library of content will continue to grow over time as more titles are added. IS WPBT PASSPORT AVAILABLE OUTSIDE THE U.S.? Streaming video from WPBT South Florida PBS– including video that this available to WPBT donors – is only available within the United States.